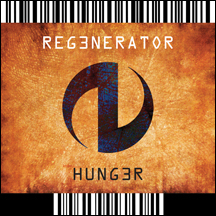 Regenerator returns to WTII with their 7th studio album, Hunger. Throughout their illustrious history, Regenerator has proven time and again the ability to deliver everything from an ethereal e-pop song to highly charged dance floor industrial. Although some modern electronica elements and other various influences have seeped into Regenerator's sound, their unique style has consistently remained intact. This formula of shared male and female vocals plays a prominent role on this latest release, Hunger. Wrex's somber melancholic growling vocals works in perfect duality with Patrice's sensual breathy vocals on tracks like Slave, Offering and Want. Other tracks like the title track, Hunger, Dreams and Mana showcase the bands diversity. Over the past two decades Regenerator has continued to evolve and the Hunger is their most complete and well-rounded release to date.